Before President Trump took office, tech CEOs made a pilgrimage to Trump Tower for a high-profile meeting despite their significant political differences. Today, they're meeting with Trump again — despite the persistent divide between tech and the White House over issues like immigration and climate change. 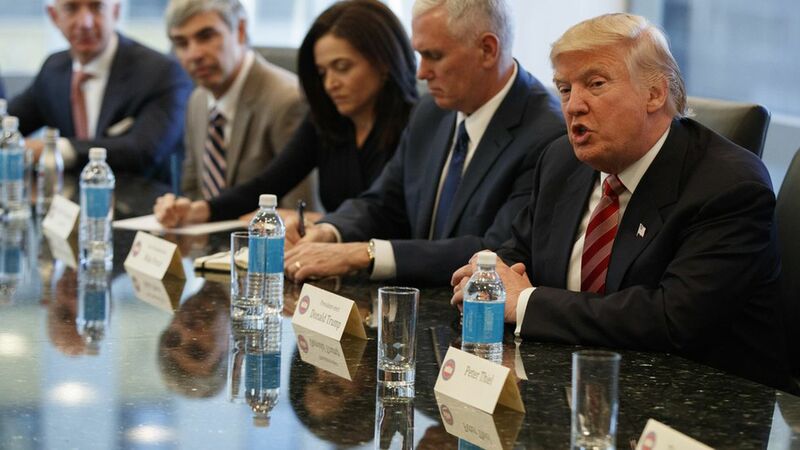 Why it matters: Silicon Valley's relationship with Trump is complicated. The industry's employees aren't usually happy when their CEOs engage with the president. But a combination of policy realities (tech would love a good deal on tax reform, for example) and a fear of being out of the loop on other discussions (such as modernizing federal IT systems) keeps executives coming back to the table. Tech giants also know a powerful White House contingent has concerns about Silicon Valley's increasing wealth and control over consumers' data, so they need to maintain a dialogue. What the White House says it wants: "This day is going to show that we have a lot of people who really want to see the government succeed and really want to work with it," a senior White House official told reporters, arguing that the meetings weren't about photo-ops. But, of course, there's also value for the White House in having the president meet with major, recognizable figures from the industry that is a major U.S. economic engine. The executives' meeting with Trump is organized by the Office of American Innovation led by Jared Kushner, the president's son-in-law. The execs will join several working group sessions, according to senior White House officials, dealing with a variety of issues related to modernizing government technology. Vice President Mike Pence will also be present, among others, as will Ivanka Trump. There's a session on high-skilled immigration, a major policy priority for tech companies who rely on the H-1B program for workers — the same program Trump wants to overhaul to protect American jobs. A group of tech leaders will also join a series of meetings on Thursday focused on emerging tech like drones and the Internet of Things, bookending what the White House has dubbed "technology week." That's organized by a different office in the White House currently run by Peter Thiel ally Michael Kratsios. Trump will also talk about tech issues during a trip to Iowa on Wednesday. The administration's decision to withdraw from the Paris climate accords, which drew significant condemnation from tech companies. A senior White House official brushed off the idea that the move had lessened interest among executives in attending — saying "we had virtually no fallback from the Paris thing." Officials say that there were more people interested in coming than the White House was able to include in the meeting. Tech, where many major companies are founded or led by immigrants, has concerns about Trump's stance on immigration. One question posed in a briefing document for attendees of the session on the program is, "How can the H-1B visa program be modified to ensure that visas are issued to the highest-skilled and highest-paid workers, while also eliminating examples of the program's abuse?" What to watch: Where the relationship between Silicon Valley and the Trump administration goes from here. Expect executive to bring up issues that matter to their companies. A source said, for example, that Apple will focus on veterans affairs, cybersecurity and encryption and human rights (CEO Tim Cook is attending working group sessions on immigration and "citizen services," Apple confirms). The company has decried the Trump travel ban for several majority-Muslim countries and on the administration decision to pull back Obama-era guidance protecting transgender students. Chris Liddell, the White House's director of strategic initiatives, says the White House hopes to keep the companies involved in these discussions as they move forward. "Largely we see them working in an advisory capacity, and again, depending on the [working group] stream and their level of interest we will have them more or less engaged," Liddell told reporters. "But obviously at the end of the day we have to do the work, so this would be just helping us with ideas." Liddell is also keen to establish an exchange program of sorts, where industry talent agrees to stints in government positions to work on complex tech issues, such as cybersecurity, sources say. Who's not: A glaring absence from the list is Facebook. Chief Operating Officer Sheryl Sandberg attended the Trump Tower meeting and CEO Mark Zuckerberg was reportedly on a White House conference call earlier this year. Update: A Facebook spokesperson said that the company received an invite but had told the White House of prior scheduling conflicts for Monday. Editor's Note: This article has been updated to correct Julie Sweet's title at Accenture.